Heinrich Luitpold Himmler (7 October 1900 – 23 May 1945) was the commander of the German Schutzstaffel (SS) and one of the most powerful men in Nazi Germany. As Reichsführer-SS he controlled the SS and the Gestapo. He was the founder and officer-in-charge of the Nazi concentration camps and the Einsatzgruppen death squads. I still lack to a considerable degree that naturally superior kind of manner that I would dearly like to possess. In the course of history periods of capitalism and socialism alternate with one another; capitalism is the unnatural, socialism the natural economic system...The National Socialists and the Red Front have the same aspirations. The Jews falsified the Revolution in the form of Marxism and that failed to bring fulfilment. Speech in Potsdam (13 October 1926), quoted in Peter Longerich, Heinrich Himmler (Oxford: Oxford University Press, 2012), pp. 92-93. Anyone who thinks of homosexual *love* is our enemy. We reject anything which emasculates our people and makes it a plaything for our enemies, for we know that life is fight, and it is madness to think that men will ever embrace fraternally. I know there are some people in Germany who become sick when they see these black uniforms, we understand the reason for this, and do not expect we shall be loved by all that number of people; those who come to fear us in any way or at any time must have a bad conscience towards the Fuhrer and the nation. For these persons we have established an organisation called the Security Service. It is vital we rid ourselves of [homosexuals]; like weed we must pull them up, throw them on the fire and burn them. This is not out of a spirit of vengeance, but of necessity; these creatures must be exterminated. We won't waste much time on the Jews. It's great to get to grips with the Jewish race at last. The more that die the better; hitting them represents a victory for our Reich. The Jews should feel that we've arrived. We want to put half to three-quarters of all Jews east of the Vistula. We will crush these Jews wherever we can. Everything is at stake. Get the Jews out of the Reich, Vienna, everywhere. We have no use for Jews in the Reich. Probably the line of the Vistula, behind this line no more. We are the most important people here. One rejects as un-German and impossible the Bolshevist method of physical extermination of a people. I hope to see the very concept of Jewry completely obliterated. It is a war of ideologies and struggle races. On one side stands National Socialism: ideology, founded on the values of our Germanic, Nordic blood. It is worth the world as we want to see: beautiful, orderly, fair, socially, a world that may be, still suffers some flaws, but overall a happy, beautiful world filled with culture, which is precisely Germany. On the other side stands the 180 millionth people, a mixture of races and peoples, whose names are unpronounceable, and whose physical nature is such that the only thing that they can do - is to shoot without pity or mercy. These animals, which are subjected to torture and ill-treatment of each prisoner from our side, which do not have medical care they captured our wounded, as do the decent men, you will see them for yourself. These people have joined a Jewish religion, one ideology, called Bolshevism, with the task of: having now Russian, half [located] in Asia, parts of Europe, crush Germany and the world. When you, my friends, are fighting in the East, you keep that same fight against the same subhumans, against the same inferior races that once appeared under the name of Huns, and later - 1,000 years ago during the time of King Henry and Otto I, - the name of the Hungarians, and later under the name of Tatars, and then they came again under the name of Genghis Khan and the Mongols. Today they are called Russian under the political banner of Bolshevism. … the curse of the great to have to walk over corpses. I don't want to hear anymore of your difficulties. For an SS officer there are no difficulties; his duty is always to remove difficulties himself as soon as they arise. How you do it is for you to figure out, not me. I also want to talk to you, quite frankly, on a very grave matter. Among ourselves it should be mentioned quite frankly, and yet we will never speak of it publicly. Just as we did not hesitate on June 30th, 1934 to do the duty we were bidden, and stand comrades who had lapsed, up against the wall and shoot them, so we have never spoken about it and will never [p. 65] speak of it. It was that tact which is a matter of course and which I am glad to say, is inherent in us, that made us never discuss it among ourselves, never to speak of it. It appalled everyone, and yet everyone was certain that he would do it the next time if such orders are issued and if it is necessary. I mean the evacuation out of the Jews, the extermination of the Jewish race. 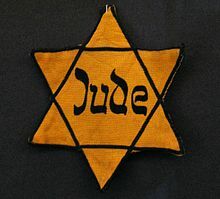 It's one of those things it is easy to talk about - "The Jewish race is being exterminated", says one party member, "that's quite clear, it's in our program - elimination of the Jews, and we're doing it, exterminating them." And then they come, 80 million worthy Germans, and each one has his decent Jew. Of course the others are vermin, but this one is an A-1 Jew. Not one of all those who talk this way has witnessed it, not one of them has been through it. Most of you must know what it means when 100 corpses are lying side by side, or 500 or 1000. To have stuck it out and at the same time - apart from exceptions caused by human weakness - to have remained decent fellows, that is what has made us hard. This is a page of glory in our history which has never been written and is never to be [p. 66] written, for we know how difficult we should have made it for ourselves, if - with the bombing raids, the burdens and the deprivations of war - we still had Jews today in every town as secret saboteurs, agitators and trouble-mongers. We would now probably have reached the 1916/17 stage when the Jews were still in the German national body. The Posen speech to SS officers (4 October 1943), original translation from "International Military Trials - Nurnberg Nazi Conspiracy and Aggression Volume IV", US Govt Printing Offc 1946 pp. 563-4. Whether nations live in prosperity or starve to death interests me only in so far as we need them as slaves for our culture: otherwise it is of no interest to me. Anti-Semitism is exactly the same as delousing. Getting rid of lice is not a question of ideology, it is a matter of cleanliness. In just this same way anti-Semitism for us has not been a question of ideology but a matter of cleanliness. Some information and observations of recent date have led me to draw up plans that I would like to bring to your attention. This concerns Jehovah’s Witnesses. . . . How are we going to govern and pacify Russia when . . . we will have conquered vast areas of its territory? . . . All forms of religion and the pacifist sects must be supported . . . , among all the others the beliefs of Jehovah’s Witnesses. It is well-known that the latter have characteristics incredibly positive for us: Apart from the fact that they refuse military service and anything to do with war . . . , they are incredibly reliable, do not drink, do not smoke; they are relentless workers and of rare honesty. For them the spoken word stands. These are ideal characteristics . . . , enviable qualities. In one of his letters to Gestapo chief Ernst Kaltenbrunner, July 21, 1944 cited in Awake! magazine, 1993, 4/22, article: What Hope for an End to War? Jasper Ridley, Tito: A Biography (Constable and Company Ltd., 1994). ...to put an end to the epidemics, we were forced to burn the bodies of an incalculable number of people who were destroyed by the disease. So we were forced to build crematoria, and on this account they are loosing a bond for us. "He also stated that he punished the culprit if the atrocities occurred in the camps." On the Einsatzgruppen: "The war on the Eastern front made the demands more difficult for our soldiers. A terrible climate, never-ending distances, an enemy population and constantly apparent partisans. Just because it was difficult, the troops prevailed. So they were forced to destroy entire villages if there was resistance and gunfire from such a village. Russians are not ordinary enemies, we can not understand their mentality. In the most desperate situations, they would refuse to capitulate. If, because of these difficulties in the East, the Jewish people suffered large casualties, it must be remembered that the German people also suffered severely." April 20, 1945 in a meeting with Norbert Masur, a representative of the World Jewish Congress. …the curse of the great to have to walk over corpses. Germans who wish to use firearms should join the SS or the SA — ordinary citizens don't need guns, as their having guns doesn't serve the State. "This is a hard job, but if the act is not carried out at once, instead of us exterminating the Jews, the Jews will exterminate the Germans at a later date." It was not Goebbels but his rival Heinrich Himmler (1900-1945) who would become, next to Hitler, the most powerful man in the Third Reich. Head of the elite Nazi guard known as the Schutzstaffel (SS) from 1929 to 1945, by 1936 Himmler had become chief of all German police. In these positions he presided over a vast network of offices and agencies that implemented terror and mass murder all over German-occupied Europe. Himmler was neither flashy like Göring nor educated like Goebbels. Mousy and awkward as a young man, he read voraciously and had developed his own conspiratorial view of the world even before he met Hitler in 1926. 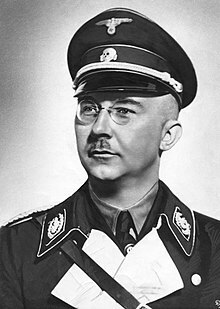 Like Hitler, Himmler feared and hated Jews and believed in the superiority of the so-called Aryan race. Himmler too was convinced that Germany had to expand to the east. Dogged and capable of meticulous attention to detail, Himmler involved himself directly in projects that targeted homosexual men and Roma as well as Poles and Jews. With justification the historians Richard Breitman and Peter Longerich consider Himmler the "architect" of the Nazi genocide. Himmler was not personally charismatic, but his enormous power and access to Hitler caused ambitious men to flock to him. He had a knack for identifying highly capable, driven individuals who would prove ruthless in pursuit of their goals. Some, like Reinhard Heydrich (1904-1942), whom Himmler personally recruited for the SS and named chief of its Security Service, became almost as famous as their boss. Others, with Himmler's help, made tremendously successful careers, particularly during the war, but are no longer household names. For example, Odilo Globocnik, Friedrich Jeckeln, and Erich von dem Bach-Zelewski, three of Himmler's trusted associates, achieved positions of almost unbounded power in the occupied east. Together they were responsible for the murder of literally millions of people. In the summer of 1941, I was called to Berlin to see Himmler. I was given the order to erect extermination camps. I can almost give you Himmler's actual words, which were to the effect: "The Fuhrer has ordered the final solution to the Jewish problem. Those of us in the SS must execute these plans. This is a hard job, but if the act is not carried out at once, instead of us exterminating the Jews, the Jews will exterminate the Germans at a later date." There was also Himmler the crusader and visionary, the man who built a romantic castle in a German forest where the knights of the S.S., many of whom could hardly read or write, were required to repair at intervals to contemplate the glory of their order and establish spiritual contact with the heroes of mediaeval Germany. For him the Russian war offered a glorious opportunity for comparative anatomy: while immense armies were manoeuvring over the frozen plains and smashing each other to pieces, Himmler set himself the urgent task of building up a collection of skulls of Jewish-Bolshevik Commissars: such things were impossible to come by in Germany. Although at the time I knew but little of the crimes he had committed, it was obvious to me that Himmler, as far as I was concerned, was intolerable. This I had to make quite clear to him, and one way or the other, I had to have a swift and final showdown with him. On the evening of April 30, shortly after the receipt of the telegram I told my ADC to telephone to Himmler, from whom I had parted in Luebeck only a few hours before, and ask him to come to Ploen forthwith. To my ADC he retorted with a blunt refusal, but when I myself spoke to him and told him that his presence was essential, he eventually consented to come. At about midnight he arrived, accompanied by six armed SS officers, and was received by my aide-de-camp, Ludde-Neurath. I offered Himmler a char and myself sat down behind my writing desk, upon which lay, hidden behind some papers, a pistol with the safety catch off. I had never done anything of this sort in my life before, but I did not know what the outcome of this meeting might be. I handed Himmler the telegraph containing my appointment. 'Please read this,' I said. I watched him closely. As he read, an expression of astonishment, indeed, of consternation spread over his face. All hope seemed to collapse within him. He went very pale. Finally he stood up and bowed. 'Allow me,' he said, 'to become the second man in your state.' I replied that that was out of the question and that there was no way in which I could make use of his services. Thus advised, he left me at about one o'clock in the morning. The showdown had taken place without force, and I felt relieved. The most impenetrable of all Hitler's disciples was the National Leader of the SS, Heinrich Himmler. An inconspicuous man with all the marks of racial inferiority, the impression he made was one of simplicity. He went out of his way to be polite. In contrast to that of Goering his private life might be described as positively Spartan in its austerity. His imagination was all the more vivid, and even fantastic. He seemed like a man from some other planet. His racial doctrine was fallacious and led him to commit terrible crimes. His attempt to educate the German people in National-Socialism resulted only in concentration camps. As late as 1943, long after Stalingrad, he still believed that Russia should be colonised by Germans as far as the Urals. On one occasion, when I said to him that it was already impossible to find volunteer colonists for the east, he insisted that the land as far as the Urals must be Germanised by compulsory colonisation if necessary and by planting the land with German peasants conscripted for that purpose. As far as the consequences of Himmler's racial theories, I have, from personal observation and experience, nothing to say. Hitler and Himmler succeeded in keeping this part of their programme strictly secret. Himmler's 'methods of education,' as practised in the concentration camps, have meanwhile become sufficiently well known. During his lifetime the general public knew only a little about this. The atrocities carried out in those camps were made known to most people, as to myself, only after the collapse. The way the concentration camp methods were kept secret can only be described as masterly. After 20th July Himmler became filled with military ambition: this led him to have himself appointed commander of the Training Army and even commander of an army group. In military matters Himmler proved an immediate and total failure. His appreciation of our enemies was positively childish. His decisions when in command of Army Group Vistula, in 1945, were dictated by fear. Despite this he retained Hitler's confidence almost up to the end. All the same even this paladin bowed down before the dictator. I was in a position on several occasions to observe his lack of self-assurance and of civil courage in Hitler's presence. 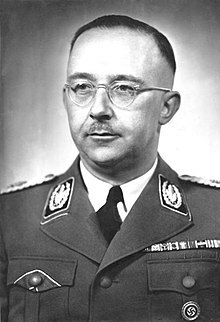 Himmler ended his life by committing suicide though he had previously consistently condemned such an action, which he had claimed to regard as contemptible and which he had forbidden the SS. He therefore escaped his judges here below and left behind less responsible men to carry on the burden of his great guilt. He had a pale, round, expressionless face, almost Mongolian, and a completely inoffensive air. Nor in his early years did I ever hear him advocate the race theories of what he was to become the most notorious executive. No doubt the bespectacled S.S. Fuehrer, who had almost fainted at the sight of a hundred Eastern Jews, including women, being executed for his own delectation, would have seen in the efficient working by S.S. officers of the gas chambers in the extermination camps an even more glorious page in German history. For it was in these death camps that the "final solution" achieved its most ghastly success. At this time a high-ranking SS leader hinted to me that Himmler was preparing decisive steps. 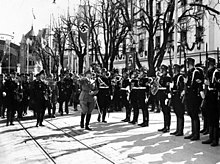 In February 1945, the Reichsführer-SS had assumed command of the Vistula Army Group, but he was no better than his successor at stopping the Russian advance. Hitler was now berating him also. Thus what personal prestige Himmler had retained was used up by a few weeks of commanding frontline troops. Nevertheless, everyone still feared Himmler, and I felt distinctly shaky one day on learning that Himmler was coming to see me about something that evening. This, incidentally, was the only time he ever called on me. My nervousness grew when Theodor Hupfauer, the new chief of our Central Office- with whom I had several times spoken rather candidly- told me in some trepidation that Gestapo chief Kaltenbrunner would be calling on him at the same hour. Before Himmler entered, by adjutant whispered to me: "He's alone." My office was without window panes; we no longer bothered replacing them since they were blasted out by bombs every few days. A wretched candle stood at the center of the table; the electricity was out again. Wrapped in our coats, we sat facing one another. Himmler talked about minor matters, asked about pointless details, and finally made the witless observation: "When the course is downhill there's always a floor to the valley, and once it is reached, Herr Speer, the ascent begins again." Since I expressed neither agreement nor disagreement with this proverbial wisdom and remained virtually monosyllabic throughout the conversation, he soon took his leave. I never found out what he wanted of it, or why Kaltenbrunner called on Hupfauer at the same time. Perhaps t hey had heard about my critical attitude and were seeking allies; perhaps they merely wanted to sound us out. ↑ Office of the United States Chief of Counsel For Prosecution of Axis Criminality, ed (1946). "Partial Translation Of Document 1919-PS Speech of the Reichsfuehrer&emdash;SS at the Meeting of SS Major-Generals at Posen, October 4th, 1943" (in English). International Military Trials - Nurnberg - Nazi Conspiracy and Aggression Volume IV. 4. Washington D.C.: US Government Printing Office. p. 563-564. Retrieved on 2016-08-28. This page was last edited on 28 January 2019, at 10:48.